Occitan pagan metallers Hantaoma from France will release their second full-length album “Malamòrt“, on March 9th, 2018 via Holy Records. Formed by the members of Stille Volk, precursor of the pagan scene since 1994, Hantaoma are back 13 years after their debut release! 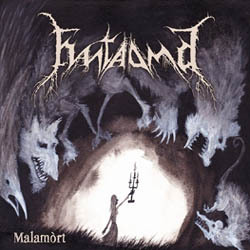 Coming from the Pyrenees, whose mythology is full of legends and stories all darker than each other, “Malamòrt” is an ultimate reference of pagan metal with multiple atmospheres between epic black metal and traditional heavy metal. A mystical and captivating journey in an original and authentic pagan metal, an ode to the spirits of the night sung in Occitan language from the earliest times, with multiple instruments rarely played in metal, such as the hurdy-gurdy, the nyckelharpa or the gittern. Lyrics evoking an ancient occult and forgotten witchcraft. The cover artwork is an original drawing inspired by the lyrics of the album by the great American artist Valin Matheis. “Malamòrt” first print will be a limited to 1000 copies digipak edition CD and is already available for pre-order.